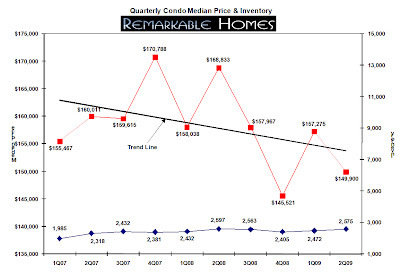 The above graph shows a median price analysis compared to the average inventory held for the Nashville condo market since the first quarter of 2007 through the second quarter of 2009. This is market information that I have collected using the official condo sales numbers from GNAR and are deemed to be accurate. This quarterly condo median price and inventory analysis clearly shows what we had been thinking, condo prices have been slipping while inventory has been rising. However, the median price drop has not been as drastic as most had assumed. The trend line shows a net effective price drop of only 3.7 percent over this time period. The more eye opening statistic is that the trend line shows a net effective inventory gain of 29.7 percent. What does this condo price analysis predict? It clearly shows that Nashville condo prices have been able to hold steady during the first half of the recession, but it also clearly shows that condo prices will drop rather significantly if the inventory levels continue to trend upward. Really, it’s a simple exercise in the laws of supply and demand in a free market economy where outside economic factors such as income, employment and ability to obtain a mortgage are at play. The good news: There are no major condo projects set to deliver after The Velocity delivers in late Summer. The lack of new construction may allow our inventory levels to fall back to the 2,000 level by the end of the year which may allow the Nashville market to avoid the condo price thrashing other areas have experienced. Only time will tell the tale, but clearly we have reached the fork in the road where one leads to sustainability and the other into the unknown free fall. The bad news: There is currently one downtown Nashville condo project in receivership, the 5th and Main project. It remains to be seen what the banks and attorneys involved with this 130 condo project will do with the remaining unsold condos. Clearly, if the bank fire sales these condos, the entire market shall suffer a price decline. Update 7/15/09: A second downtown condo project called Rolling Mill Hill has entered receivership, but the 5th & Main condo project has reemerged from receivership and is writing new contracts.